This section describes mining methods similar to those used at the Talargoch mine. 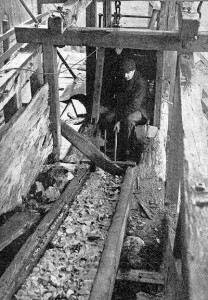 Most of the pictures are from Cornish tin mines but the process was very similar to that of mining lead. Sussex was at one time the great iron-smelting district of england. 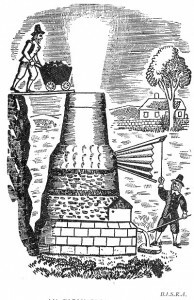 The picture, from an engraving on an old clock-face, shows an early eighteenth-century blast furnace in the Weald of Sussex. Cornish tin miners ready for going below. 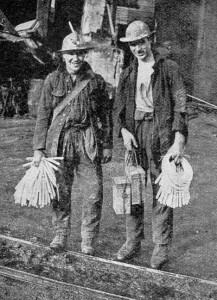 They are wearing specially hardened protective felt hats, to which candles are stuck with lumps of clay to light them to work. 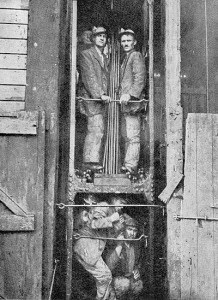 The Cornish miners in the lower compartment of this primitive mine lift do not look very comfortable. But doubtless they prefer this way of getting to and from their work to the use of the old man-engines or many hundred feet of ladders. 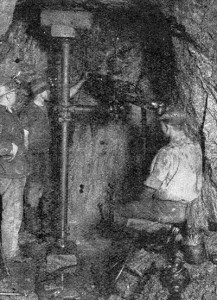 The mechanical air-drill has now largely ousted the hand-drill used in Cornish mines for a thousand years. Here you see one making holes for blasting charges. The very ancient tin-mining industry of Cornwall is still far from dead. 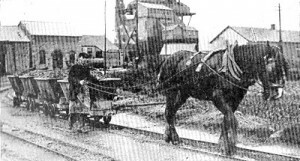 Here we see a train of ‘tubs’ or small trucks carrying loads of tin ore to the crushing mill, in which the ore will be broken into small pieces for further treatment. The ore coming from the mine is in lumps which have to pass through breakers. This workman is raking ore from a chute into a breaking machine. The ore is probably the compound of lead and sulphur commonly called galena. Fragments of specially picked galena were often used in the early wireless crytal detectors. 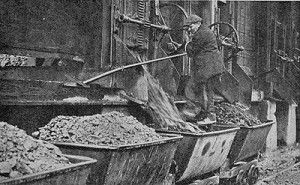 Crushed ore being run from hoppers into ‘tubs’. The man has a queerly-shaped shovel handy to his reach for starting a flow or trimming a load. The ore will be crushed fine, washed to rid it of useless stuff, roasted to burn out certain impurities, and finally smelted in a furnace. 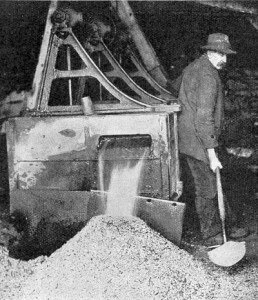 The ore has to be broken up small, similar to that seen in this heap, before it is ready to undergo one of the various processes of smelting used for extracting lead from it.